You might want to check with participants in that to see how they dealt with the problems you’ve identified. Often the problems you expect are not the ones that come up in practice. Interesting comparison. I scanned one of the past events and observed a highly presentational, demonstrative form of science instruction. “Watch as I show you an interesting demo. Listen as I tell you about the principles it illustrates.” This is, again, the form of instruction that is most familiar to the general public. Watching colleagues struggle to teach what has been called America’s most hated subject doesn’t sound like great entertainment to me. What will the success criteria be? How much fun, fun, fun the judges have? How much the non-existent students learn? The extent to which the participants manage to dodge the derisive criticism of the celebrity teacher-judge incarnation of Simon Cowell or Gordon Ramsay (who will no doubt be brought in to generate ratings)? Perhaps they should rename the show ‘So You Think You Can Teach’. I participated in an Exploratorium “Iron Science” show back in the day. Dan already hit on one big difference; it is explicitly pitched as a demonstration, not as a lesson with the goal of student (audience) mastery. Another big difference is that it actually wasn’t a competition. There was no winner at the end (departing from the structure of Iron Chef). Wow. If teachers ever wonder why they’re paid poorly, pushed around, used as punching bags by state legislators, and routinely mandated that they do the impossible, the Twitter backlash against this contest is explains it all. Any profession that is taken seriously, valued, and reasonably well-paid has some sort of aspirational entertainment made about it. This post isn’t about inspirational movies, mate. Doctors, lawyers, police, firemen, realtors, even investment bankers have some inspiring movies/tv about them. None of them are “true to life.” Get off your (low) horse and show off a little. No one will value you if you don’t. 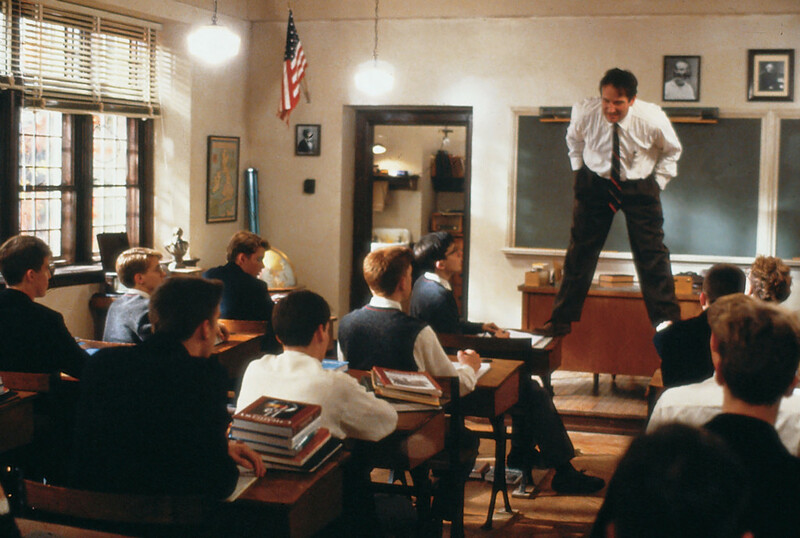 There is no shortage of inspirational movies about teaching. But imagine a contest between family-practice doctors to see who was the best caregiver. How would that work, given that different patients have different needs, and that an important part of the medical profession involves evaluating those needs and adjusting care in response? There’s nothing fundamentally wrong with showing off, but what can be shown off isn’t what’s most important about teaching. @Gloria: I agree that so much of our work is about figuring out the particular needs of our students. This is true both on an individual basis (what does Rachel need?) but on the level of a class (what does 2nd period need?). At the same time, there are elements of good teaching that go beyond a particular group of students. We know math, we know how people *usually* think about that math, we know principles of lesson design, we know activity structures that help lots of different people connect to that math. We see this every time we’re taught math at a conference or every time we teach math to a new group of students. In our complex, inter-connected work, I’m not sure how to decide what is more or less important about teaching. In the long-run, we can only get by with marrying knowledge of our students and our schools with our pedagogical and content knowledge. So I’m not sure how to look at teaching and decide that half of this equation is more important than the other. Let’s grant, though, that the parts of teaching you can show off in a one-off event like this aren’t the most important parts of our work. Are they unimportant, though? I don’t think they are. And while I have no idea if this event will be well-designed, the arguments against the event I’m reading are too strong: for example, your argument would preclude not just this SXSW event but also any public discussion of pedagogy that didn’t include actual students. Do we similarly take issue with Deborah Ball’s discussion here? So I’d say that just because something isn’t the MOST important thing about teaching doesn’t mean that it may not be important and worth sharing. The most important parts of teaching may have to do with our knowledge and care for particular students, but there’s other stuff that matters too and is worth sharing. Why not talk about that as well? I said this on twitter, but I’ll say it here as well: I think that competition has no place within departments and can be absolutely corrosive, and I’m not particularly excited by competition within teaching. That said, I don’t get why this competition worries people when there are competitions throughout our world. For example, PAEMST is a competition between teachers — do we have an issue with that? Does that negatively impact the profession? Maybe it does, I’m just looking for consistency. My take, in sum: no one has pointed to a structural feature of this event that convinces me that it’s the wrong *sort* of thing. Sure, it leaves out a huge element of our work, but how could you leave everything in? Yeah, competition is kind of goofy, but it’s common in edu and people don’t usually speak up about it. Maybe it won’t focus on the most important stuff about teaching, but that doesn’t mean that it won’t focus on something important. It probably would be best to withhold judgement about this event until we know that it failed to draw the audience’s attention to important elements of teaching rather than damning it at the outset. Otherwise, we risk creating a world where public discussion of the invisible work of teaching is discouraged, for the sake of preserving the sanctity of classroom work. For that matter, we see this every time Dan shows us what developing a question or leading a 3Act looks like in one of his keynotes. Dan doesn’t know the audience, is creating an experience for hundreds of people, and yet shows us an element of teaching practice. Is this a misrepresentation of teaching too? It’s the best approximation of my teaching I can offer a keynote audience, but I’d much rather people observe them in a classroom. In the keynote, “students” don’t share with each other much because of time constraints. I don’t draw on student thinking much, because there are too many people for that work. I don’t dive hard into the actual mathematics because the audience is generally K-12 teachers. The structural features matter. For example, PAEMST is a competition between teachers — do we have an issue with that? Does that negatively impact the profession? Maybe it does, I’m just looking for consistency. Just learned I’m wrong about this FWIW. I’ll wager that everyone who is disinterested in applying for PAEMST is also disinterested in applying for this contest. (Are you seeing PAEMST winners or applicants now slagging competition here?) I’ll also wager that some of those same folks would have an interest in applying for an experience where they a) see how another group handles the same teaching task and b) receive interesting feedback from experts. Lucky for me, these hypotheses are hard to falsify. My take, in sum: no one has pointed to a structural feature of this event that convinces me that it’s the wrong *sort* of thing. Sure, it leaves out a huge element of our work, but how could you leave everything in? I can only point to the 1:1000 class ratio again. I suspect it’ll elevate negative teaching practices and perceptions of teaching that (for example) lesson study doesn’t, with fewer observers closer to the action with fewer students, all of whom are known to the teacher. Maybe my suspicions are wrong but I am responding to structural features of the event here. I can only point to the 1:1000 class ratio again. On Twitter I got the sense that you’re skeptical that this could be pulled off. I don’t exactly share that skepticism, but then again maybe you know things about the venue that I don’t. If the only issue is the class ratio, that feels like an important design consideration for the Chalkbeat team. Are there other important design considerations? From other conversations on Twitter I get the sense that there are important guidelines for facilitation. Design Consideration #1: Make sure the group playing the “class” is about the same size as a k-12 class. … [Akihiko Takahashi] participated in such a “teach-off” on a stage in front of 1,000 teachers. I can’t find any evidence that Green plans on assembling a mini-classroom of 30 students on a stage. Certainly, the mini-classroom option involves many more logistical headaches than the not-mini-classroom option. Applicant teachers should expect to have much more certainty on this point either way. This is the sort of detail that teachers should expect to be nailed down in advance of applying. … it might be fun to think about what it would take to do this sort of thing as well as it can be done. I can’t speak to the specifics of *this* event but I do know that at the NCTM regional in Chicago last year, Takahashi did a lesson study workshop and brought in 30 kids (and their teacher) from a Chicago public school. The teacher did a demo lesson and then the audience discussed it. So it can be done, and has been done. That doesn’t mean this will (or won’t) work that way. But I did hear very good things about that session from people who attended. You might find the Educating Essex British tv (channel 4) series worth watching if you haven’t already seen it? Concentrates more on the school life than teaching but I think is a fair reflection of the challenges of education. This feels like an insulting gimmick that demeans my profession, and apart from its value as an attention-seeking gambit, I cannot imagine a good reason why a news organization would feel the need to host a game show at a conference… except to seek attention. The fact that the editor-in-chief felt compelled to pen a 2000-word defense of the gimmick strongly suggests that she *knows* it is a bad idea. This whole thing leaves me very disappointed in Chalkbeat. There’s so many more relevant reasons to think it’s a lousy idea. 1) It’s only elementary school math. How idiotic. 2) It’s promoting one particular view of teaching, a false one, that it’s collaborative. Yes, yes, yes, I know a bunch of teachers on Twitter will piously discuss their collaboration time, but for most of us, it’s a solo play. But Green thinks teachers should work together, so she demands they do for the competition. 3) “Teacher celebrities”? Really? If there’s one thing we know, it’s that teachers don’t agree on the definition of “great teaching”. So any teacher celebrities will not be dealing with an absolute standard, but their personal preferences. Making the win pretty useless. I mean, teachers don’t even particularly value National Board Cert, so why would they care about this? To me, the appropriate response to Green is “Girl, this ain’t about you.” But I think a real teachoff would be fun. Of course it’s only one aspect of teaching, but ultimately, classroom delivery is a pretty essential part of what the public thinks of as great teaching. … but ultimately, classroom delivery is a pretty essential part of what the public thinks of as great teaching. No other profession accommodates the public like you think teachers should. The public thinks that being an attorney means making speeches and objections in front of a judge. Why accommodate that image? We’re educators. We should educate. Cmon, you’re the guy who got famous for a TEDx talk about the essential nature of engagement. You said you sell a product to an audience that doesn’t want to buy. What is engagement if not holding attention and suspending audience disbelief? And how is selling not fundamentally about the delivery mechanism? Think about ed school and books on teaching. They all present teaching in terms of performance. We always tell teachers they need a classroom presence, a teaching voice. Math teachers have to take kids who think they can’t do math and convince them otherwise, and for many of us, a critical first step is to engage their interest through our persona and our presentation. Now, it’s certainly true that some teachers confuse engagement with teaching: all persona, all entertainment, no content. But that’s why we feel such a great spark when we watch good teaching in action–because we can see how the teacher uses the engagement to communicate content. The public pays the bills for our teaching. I think their opinion about what constitutes great teaching matters. The public pays doctors. They should tell doctors how to treat themselves. I am fascinated by this… in part because I share the initial recoil at the idea that a lesson can be a competition, but also on a deeper, more appreciative level. This competition will bring new light to good math teaching – if only through discussions like this. We desperately need new light on the profession. There are over 100 permanent vacancies in secondary math in WV. We don’t have a pipeline. We need math teaching to grab the heart, minds and interests of more young people. That said, the defense given by Green is a bit goofy – she was inspired by research lessons and instructional activity demonstrations, both of which are situated to give the ‘viewer’ a deeper understanding of what students know, and how they come to know it. The very purpose of a research lesson is not to “show off” so much as to “pry in” – so that we can better understand the structure of the concept and how deep understanding of it builds. The public “lesson” part is the appetizer to the main meal which is the lesson deconstruction, debrief, and future edits and iterations. It seems that they’ve reworked the page describing the Great American Teach Off. When I looked back at the version cached by Google on Jan. 4, there are some significant differences from the current live version. Among those differences is the statement that the lesson will be executed “with an onstage ‘class’ of 7-10 adult volunteers serving as students.” So FWIW, they fixed the 1:1000 ratio problem. Regardless, the first thing I thought of when I heard about this was the Key and Peele skit from a couple years ago called “Teaching Center.” It was a spoof on SportsCenter and it envisioned a world where teachers were treated like professional athletes. And while some things were cool (i.e. being paid millions of dollars), there was a scene where they did a play-by-play of a history class and it was cringeworthy. I’m weighing in late here, but in response to one of the above threads, we never intended to have the whole audience serve as the students. As we’ve clarified in our revised page here (https://chalkbeat.org/the-great-american-teach-off/), which has more specific language, we’ll have 7-10 adult audience volunteers serve as students. Imperfect as a representation, for sure, but we still think everyone will get something important out of the 20-minute instructional activity + the followup discussion — that “something important” being better understanding about the nature of teaching and math teaching in particular. And for the record, Dan, at the 1,000-person “Iron Chef”-style teach off in Japan that Akihiko described, the students were the teacher’s actual students, and they all sat onstage. Thanks for the discussion, all. This is probably obvious, but I agree w/ Michael Pershan: the success of the Teach-Off depends on execution, and we and our teacher design team have put a lot of thought into those details, so our hopes are high. Thanks, Elizabeth. I’ve updated the post with your comment. As a fan of chef-themed math education discussion, I want to hop in here. Dan, I’m glad you saw the push/pull of “non-teachers need to hear more about how Education works” and “let’s not cheapen our field to make it bite-sized enough for SXSW.” There’s no simple solution there, and Lisa’s concern hits closest to home for me. The relationships with students are my favorite part of teaching, and they are also the part that I’d most like to showcase, promote, and show to an audience of 1,000+ non-teachers. Any success I’ve had in costumes, silliness, or tweetable stories have their roots sunk deep in a culture where students and teacher respect each other. I’m curious to see how a competition could showcase that. I saw a tweet about the competition and clicked on it thinking, wow, I’m not sure what this will look like, but this is something that could get me out of my comfort zone, and a great opportunity to learn from others just by watching them. But was mortified when I read the information about how it works. I can’t imagine ever participating in such an event.